To celebrate MLK day, we are reposting this story in honor of brave teachers everywhere. On April 5, 2018, noted civil rights pioneer Frederick D. Reese died at the age of 88. In addition to his 50-year ministerial career at Ebenezer Missionary Baptist Church, Reese was also a long-time science and mathematics teacher in the Selma City Schools. He was head of both the Selma City Teachers Association and the Dallas County Voters League. It was Reese who first invited Martin Luther King and the SCLC to Selma for the events that led up to the Selma-to-Montgomery march. In the Spring of 2015, almost exactly three years ago this week, Reese welcomed Keystone and the College of Education to Selma to discuss the Selma Teachers’ March, an event which he led, and which mobilized communities in and around Alabama’s Black Belt a full six weeks before the violent events now known as Bloody Sunday. Reese was joined at the meeting by other teachers who were with him at that time, and who were part of his peaceful but profound protest. It was a memorable day for us, and led to a great story in our Centennial issue of Keystone. Our emphasis was “teachers making an impact,” and few teachers ever, anywhere, made a more dramatic statement with their quiet actions. From the recent blockbuster movie to the 50-year reenactment of the Edmund Pettus Bridge crossing, people around the country and throughout the world have recently been riveted on the events of Bloody Sunday and the triumphant Selma-to-Montgomery march which began on March 7, 1965. Almost forgotten in this frenzy is an event which also occurred in Selma, on January 22, 1965, that involved a courageous band of black school teachers. The Teachers’ March, as it has come to be known, is considered by many, including Civil Rights stalwart and U.N. Ambassador Andrew Young, to be “the most significant thing that happened in the civil rights movement since Birmingham,” referring to the infamous events involving Bull Conner and black demonstrators in 1963. Recently, five of those teachers — Rev. 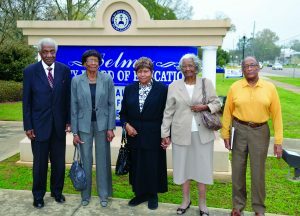 Frederick D. Reese, Sarah Carter Craig, Elmyra Martin Smith, Sally Surrency Jackson, and Lawrence Huggins — sat down with the Keystone to discuss not only the events of that memorable day, but also the important role that teachers played in the community at a critical time in the town’s history. The Auburn University College of Education applauds the courage and leadership of these and other teachers who participated in the march, as well as the thousands of teachers across our land who work hard every day to serve their students and make our communities great. While progress in terms of basic civil rights for black citizens had been made in various pockets across the South by the early 1960s, the western counties of the Alabama Black Belt —especially Dallas and Perry — had not shared in that progress. The rights of black citizens in the county seat towns of Selma and Marion had been particularly restricted. As a result, activists and organizers from the Student Non-Violent Coordinating Committee (SNCC) had been working in these places, leading demonstrations and training young people in the forms of passive resistance. Rev. Fredrick D. Reese was a science and mathematics teacher in Selma, and was a highly-respected leader in the town’s black community. He was not only the head of the Selma City Teachers Association, he also led the Dallas County Voters League. He had been active in voter registration attempts, had been jailed, and was the man responsible for inviting Dr. Martin Luther King Jr. and the Southern Christian Leadership Conference to Selma in the first place. Reese was a prominent witness in Federal Judge Frank Johnson’s courtroom following the events of Bloody Sunday, and was the primary force behind the Teachers March. Army veteran Lawrence Huggins, who with his wife Dorothea was a teacher at R.B. Hudson High School, well remembers the students leaving class every day. Huggins pointed out that Selma did not have a large class of black professionals. Community members looked up to and respected the teachers, many of whom held advanced academic degrees. Reese himself had four degrees, including a Doctorate of Divinity. It was customary then in Selma that blacks needed a “voucher” in order to register to vote; that is, someone who was known to Courthouse Registrar Victor Atkins who would vouch for that person. Few people were willing to do that. Jackson said that every time she went to register there was one excuse or another why she was not allowed to do so. Other individuals experienced the same frustration. Reese suggested an alternative. Reese, whose graceful personality blends elegance with authority, knew that in all the events of the Movement, across the South and across the nation, no group of teachers had ever marched for a cause. They had never banded together as an obvious professional class, as the most respected members of their respective communities, to demand their basic rights. Sarah Carter Craig, who taught social studies and American History at R.B. Hudson High School, had successfully registered to vote. To do so she had gotten a voucher — a prominent black man who was well known to both races — but she still had to pass a 68-question literacy test. She said it contained such questions as “Appropriation of money for the armed services can be only for a period limited to ____ years,” and “Of the original 13 states, the one with the largest representation in the first Congress was ___,” and “On the impeachment of the chief justice of the Supreme Court of the U.S., who tries the case?” Several questions reminded test-takers that the right to vote was not in the original Bill of Rights. Guidance Counselor Elmyra Martin Smith passed the same test and registered. Both women remarked that such a test would be challenging for the average citizen, white or black. As the group wound its way toward the small Alabama Avenue entrance to the county courthouse, it went through the downtown business section. Jackson has a particularly sharp memory of that moment. Three times the teachers attempted to enter the courthouse. Three times they were shoved back down the steps with wooden clubs. A wire service photo circulated nationally the next morning which showed an angry Clark shoving his club into Huggins’s stomach. After the second attempt, Clark threatened to arrest the entire group of teachers. But that did not happen. Clark emerged from the meeting and for a third time shoved the march leaders back down the courthouse steps. But the teachers had made their point. As the teachers returned to Brown Chapel AME Church to regroup, they were cheered as they walked through the neighborhoods. Tears of joy and pride were shed as teachers and neighbors gathered in song. The teachers had been prepared to be arrested, and possibly lose their jobs. Over this latter point there had been great reservations by many people, since it affected the very livelihood of their families. But Rev. Reese had assured them, “They can’t fire all of us!” In the end, only Rev. Reese was fired, though he was soon brought back with honor. He remained with the system until his recent retirement. Most of those 105 teachers were part of Bloody Sunday and made some parts of the march to Montgomery, including all five of those who visited with us that day. Their passion and stories could fill up many books.